What's the Real Difference Between Brown and White Eggs? Chickens tend to produce eggs in one of two colors, white and brown. But is there any nutritional difference between them? And what accounts for the difference in shell color in the first place? These questions were recently posed to C. Claiborne Ray in the New York Times, who spoke to Cornell University scientist Tro V. Bui to get the answers. Very simply, there is no discernible difference in nutritional value. Brown eggs tend to have more omega-3 fatty acids, but the difference is miniscule. There's also no difference in yolk or taste. Genes determine shell color, Dr. Bui said. 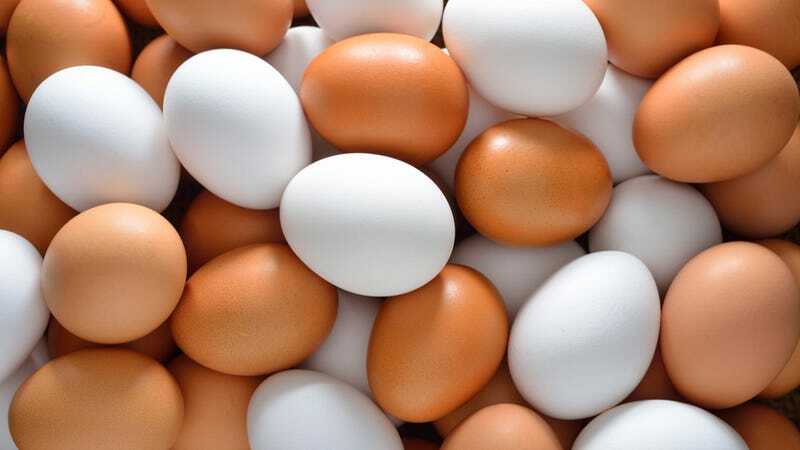 White-feathered chickens with white earlobes lay white eggs; red or brown ones with red earlobes lay brown eggs; and the Ameraucana breed, also known as the Eastern egg chicken, lays eggs with blue shells. Shell quality does not differ by breed, though younger chickens lay eggs with harder shells. Brown-egg chickens tend to be larger and cost more to feed and raise, so white eggs are more cost-efficient. That said, the type of feed can affect the egg's nutritional content, as well as its yolk color. There's more at the NYT, including the genetic and chemical variables responsible for determining shell color. Related: Americans — why do you keep refrigerating your eggs?